Multi-valued (Multivalue) Fields (Managed Properties) in Search not Returning All Values | Are you a user? Update 20100908: Leslee completed this in the production environment and it worked the first time. I’m calling it a wrap! Update 20100826: We just did this in our staging environment and got it to work the first time through! Update 20100802: I’ve rewritten this post a couple of times, adding more detail as we find it. We think we might be on to finding "the recipe," but we’ll only know for sure when we repeat the process in the staging and production environments and get repeatable results. This post is "in-work." Oh man, this has been driving us CRAZY (just ask Leslee)! We have a multi-valued column in SharePoint (Subject) and we couldn’t get all the values to show up in the search results. All we could get is the last value. See this post: Always returning last value. We had different results before we upgraded to SP2. In SP1, we were getting some weird results with some of the values being returned as ;#Value;# or some such nonsense. We hope we don’t see that again. Currently, we are on SharePoint 2007 SP2 with the February 2010 June 2010 cumulative update with the infrastructure updates installed. There were a few hints from Ontolica (Surfray) from this post. From this post by Michael Schau, we started to deduce a method to fix the problem. Here’s what we came up with. Remove the mapping between your managed property and crawled property. De-select the "Include values for the property in the search index" field on your crawled property. Add your mapping back between your managed and crawled property. Change the HasMultipleValues column to True for your managed property in the MSSManagedProperties table in the Shared Services database (void your warranty). Change the VariantType column to 4127 for your crawled property in the MSSCrawledProperties table in the Shared Services database (void your warranty again). Perform an incremental crawl (not sure if this is really necessary, but it’s pretty quick). Perform an IISRESET on all SharePoint boxes. Let’s start with the ugly part first. You’re not going to like this but, if MS doesn’t have software that correctly updates the database, then we’ll do it manually. After all, it’s just a database! Find your SSP database in SQL Server Management Studio. Find the MSSManagedProperties table and open it for editing. Locate your managed property using its FriendlyName and change the HasMultipleValues column to "True" (or 1). Now find the MSSCrawledProperties table and open it for editing. Locate your crawled property using its PropertyName and change the VariantType column to 4127. We found when you change the VariantType to 4127 the Multi-valued field changes to "Yes." All of the multi-valued fields we could find had this variant type. The variant type for a text field is 31 (0000000011111). The variant type that shows up on a multi-valued text field is 4127 (1000000011111). Could it be that the leading bit identifies the field as multi-valued? 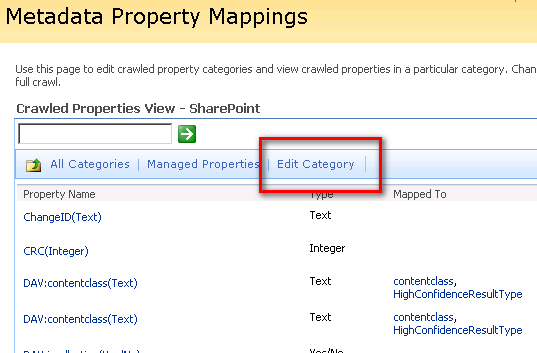 Here’s an incomplete table for the crawled properties in the SharePoint category. You are done modifying the database. Great job! You’ve now voided your warranty. Now we’re going back to Central Administration in the SSP where your search is located. 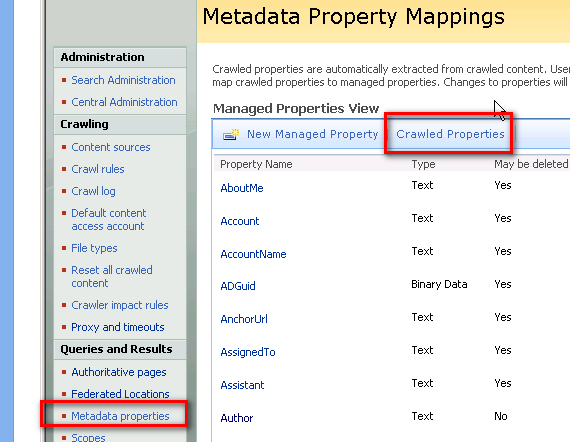 Remove the mapping for the crawled property from the crawled metadata store. 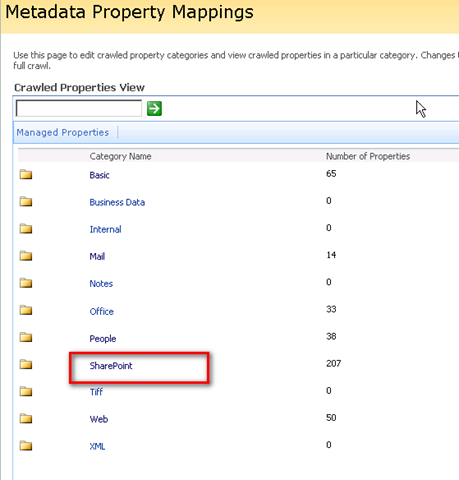 You can get there from the Metadata Properties page by clicking on Crawled Properties. Find and edit your crawled property. Remove the mapping and de-select the "Include values for the property in the search index" field. 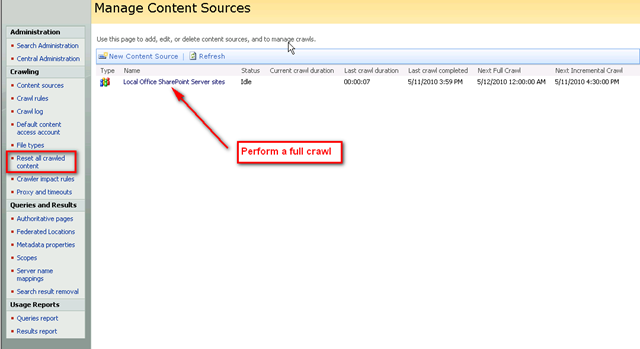 Find your crawled property group (SharePoint in our case) and drill into it. 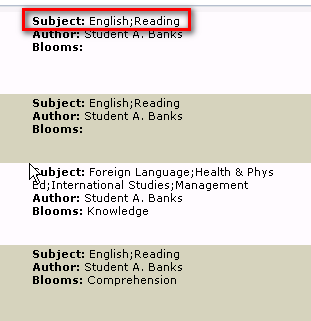 Click on Edit Category . Select the checkbox to delete all unmapped crawled properties and click OK.
Reset all crawled content and perform a full crawl. I hope you don’t have too much data! Perhaps you should have thought to limit it before you started! After the full crawl has completed, you need to add your property back. It should be in the crawled properties. You need to map it back to your managed property. After you have it added back, perform ANOTHER full crawl, after which, you should see the property is correctly classified as multi-valued. What does this get you? Now, if you look at the raw XML search results for your managed property, you should see the multiple values returned. In this example, we’re looking at a managed property called owssubject. And, if you apply your XSLT, you should get something that’s nice looking, like this! I stumbled upon it while trying to resolve two search issues for a client. Created a new web app with new SSP and proper configuration. Now as we migrate the old files to the new environment we have encountered two issue. -issue one: on any Office 2003 (doc/xls) file several defined metadata fields are reset after moving to new site (for example if a doc had check boxed meta around location, team, department then when the doc was opened on the new site all these fields would be unchecked. -issue two: the crawl is kicking back “The filtering process coupld not load the item. This is possibly caused by an unrecoginized item format or item corruption” but only on any .doc or .xls file. Any docx, pdf, xlms etc.. works fine. These are likely related and after reading your post i have a couple ideas i will attempt in test. Sorry to hear that. I haven’t yet had a reason to delve into this issue as it relates to SharePoint 2010…yet. Do any of you reading this thread have any clues as to why a simple CHOICE column defined at the site collection level, associated with a site collection content type, which is used in a Doc Lib and has dozens of filled-in columns using the choices, does NOT show up as a crawled property? This is not a multi-valued choice column, just a simple single valued drop-down list. I have dozens of other such columns defined the same way and they all show up as “ows_xxxx” where xxxx = the name of the column. One particular instance is not showing up and I can’t figure out why. Encountered this issue on our site and found your solution, however we did not want to void our warranty. We contacted MS Premier Support and they offered two workarounds that did not involve modifying the database manually and voiding the warranty. – Remove crawled properties, reset index, etc. – Create a dummy list item and select more than one value for the lookup value. 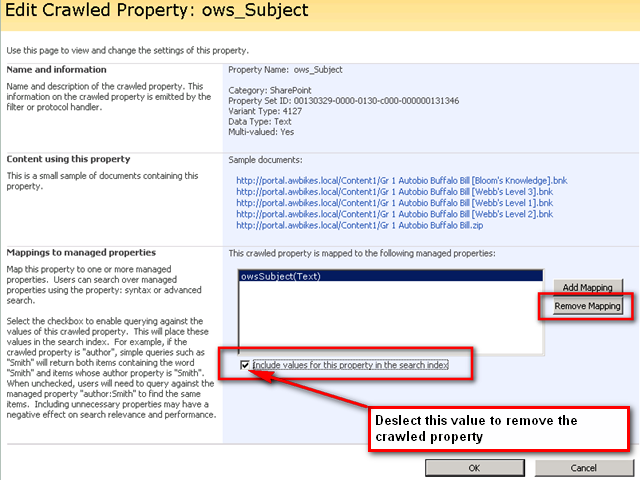 – Add both crawled properties to managed property (the existing one and the new dummy one). – Now the results should have multiple values. It’s magic. – Since SSP determines multivalue based on first crawled item, create another site collection and put dummy content in it that has multiple values in it.